In the early 1990s, a nationalist paramilitary group called the Mkhedrioni stripped Tbilisi of its central heating infrastructure, pipes and all, and sold it illicitly in Turkey. To this day, most buildings are heated by private boilers. 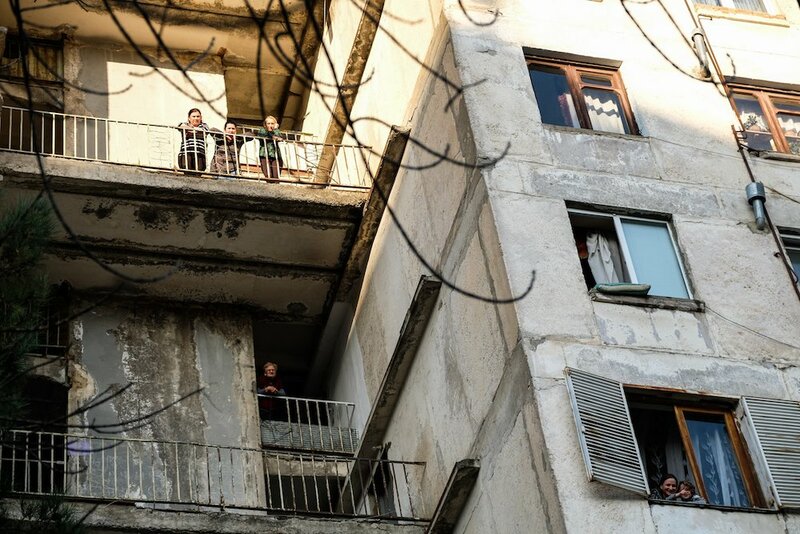 At the same time, tens of thousands of internally displaced people (or IDPs) were pouring into the capital, fleeing civil war in separatist Abkhazia, occupying whatever empty buildings they could find. Many are still in place. Then there was the 2002 earthquake that destroyed or destabilised much of the Old Town. Many formerly Soviet cities suffered in the years immediately after the collapse of the Union, but Tbilisi got a rougher deal than most. What purpose does an architecture biennial serve in a city like this? The high-end example of self-important institutions like Venice won’t cut it here. 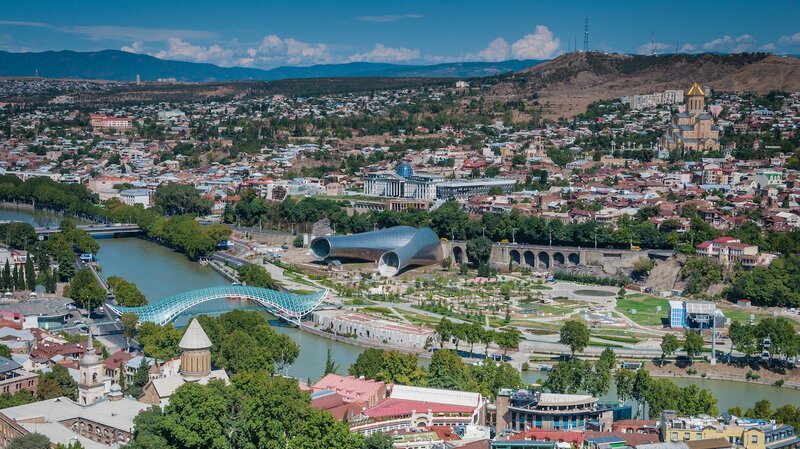 Tbilisi is a relatively small city and its architectural scene is close-knit, but its problems are profound, and they need intellectual as well as practical solutions. 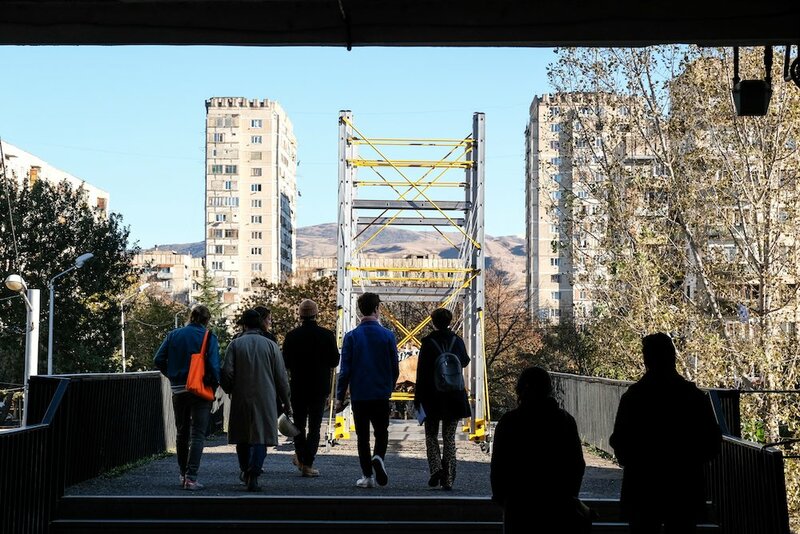 The inaugural Tbilisi Architecture Biennial (TAB), held in October and sponsored in part by Creative Europe, attempted to offer some. 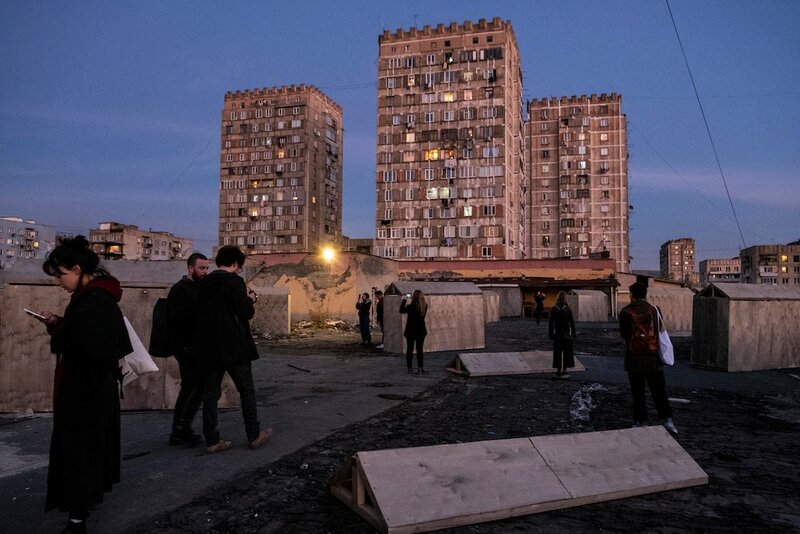 The artistic directors — Tinatin Gurgenidze, Gigi Shukakidze, Otar Nemsadze, and Natia Kalandarishvili — decided to make “informality” the central theme of the event, with the title Buildings Are Not Enough reinforcing that TAB was as much about ideas as the built environment. Informality has been a buzzword in architecture for years now, but what took place in Tbilisi was not an exercise in taste-making. The city’s appearance is defined by a million private modifications and extensions, responses to natural disasters, economic hardships, and population flux. Nowhere is this more evident than in Gldani, the Soviet suburb where the Biennial was based. Here, the uniform, prefab nature of the rows of apartment blocks is constantly and conspicuously disrupted by informal interventions: balconies bricked in against the cold, heating pipes knocked through walls, endless garages erected out of scrap metal. Gldani is a residential district that was thrown up in the 1970s and 80s in the north-east of the city. 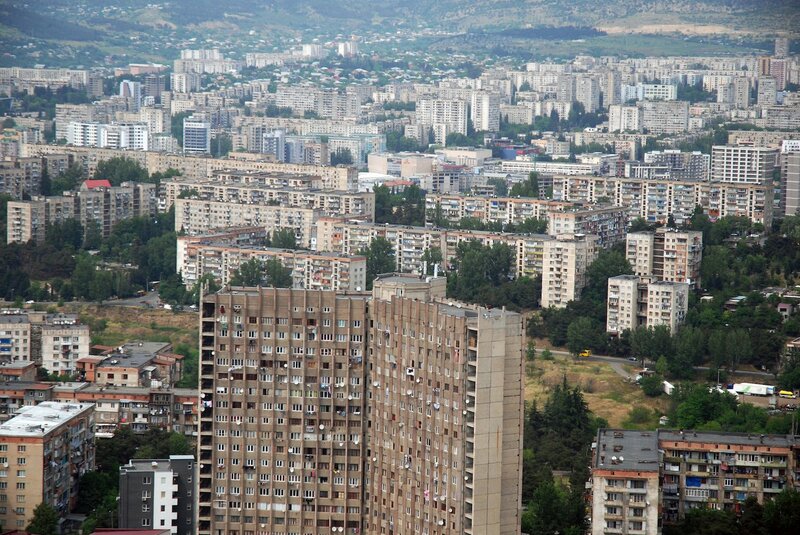 Structured around a central avenue, with rows of drab brezhnevki housing blocks arrayed on either side, it stretches up into the foothills that surround the capital. It has always had a large immigrant population, and since the 90s has been home to thousands of IDPs. 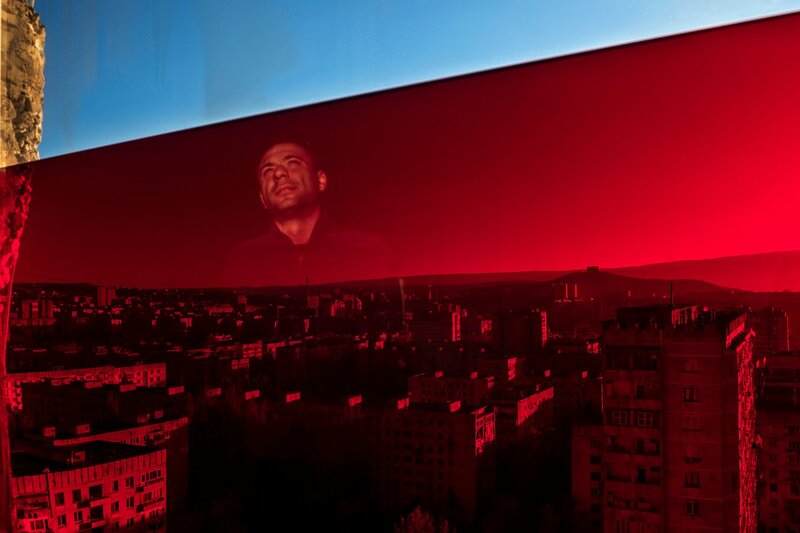 With a population of 300,000, the district is bigger than any other city in Georgia; it’s also precisely the kind of place hit hardest by post-Soviet deprivation, and which is elided in the public image of Tbilisi’s recent cool renaissance. It makes sense that TAB, with its spirit of urgency and humility, be set here. “We wanted to decentralise Tbilisi,” co-founder Tinatin Gurgenidze told me. Both public and professionals have some way to go. At the turn of the last decade, Georgian architecture was riding a wave, with the economic reforms of former President Mikheil Saakashvili heralding a brief boom in speculation and construction. But after a few fertile years and a lot of expensive (and often ugly) statement pieces of po-mo civic architecture, the fun came to a halt. Now, outside of a few notable success stories (the Fabrika hostel by Multiverse Architects, or the Rooms hotel chain), the country’s young architects are largely stuck working on bland, damaging housing developments. Given the bombast of the Saakashvili boom, a degree of humility on the part of the country’s future architects would probably be useful, too. Indeed, this was the note sounded by the Biennial’s two biggest-name speakers. 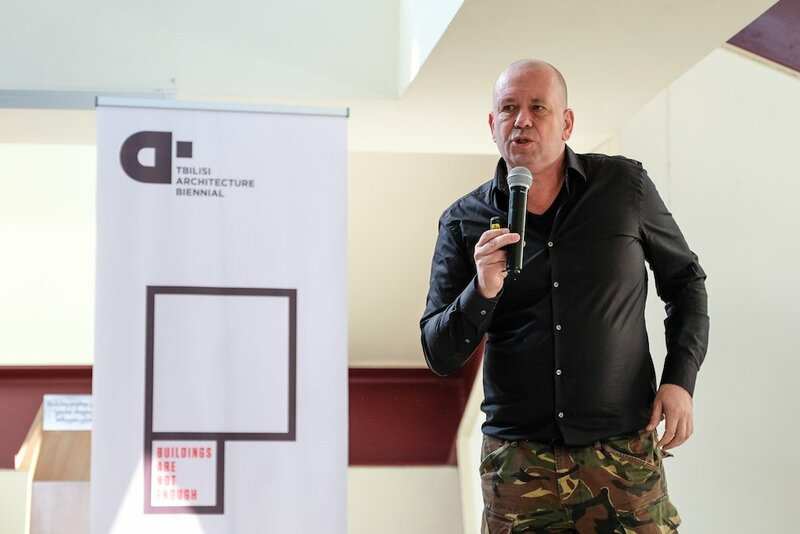 Reinier de Graaf of OMA delivered a keynote address full of his usual witty takedowns of the architecture world’s idealism and vainglory. Alexander Brodsky, the secular saint of humble and temporary structures, also spoke, as well as running his own installation — The Mainstream, a series of small, shed-like huts erected on the roof of a nearby road bridge. His son David, a Tbilisi resident, had bravely (or foolishly) turned his own flat in the centre of town into Boiler, a novel take on the collapse of architectural distinctions between privacy and community that saw the doors left open to whoever wanted to pop in over the week. The perpetual house party that resulted provided a social counterpoint to all the well-intentioned theorising going on elsewhere. While the industry was soulsearching at its symposium, a collection of domestic and international artists and architects was tackling the question of informality in more practical terms. Scattered across the walkways, courtyards, and other interstitial spaces of Gldani were the artworks of the “outdoors exhibition”, curated by TAB co-founder Gigi Shukakidze, head of experimental Tbilisi studio Wunderwerk, as a kind of conceptual art treasure hunt. This was TAB’s attempt to follow up on its decentralising promise, to provoke conversation with the “real people” of Gldani. 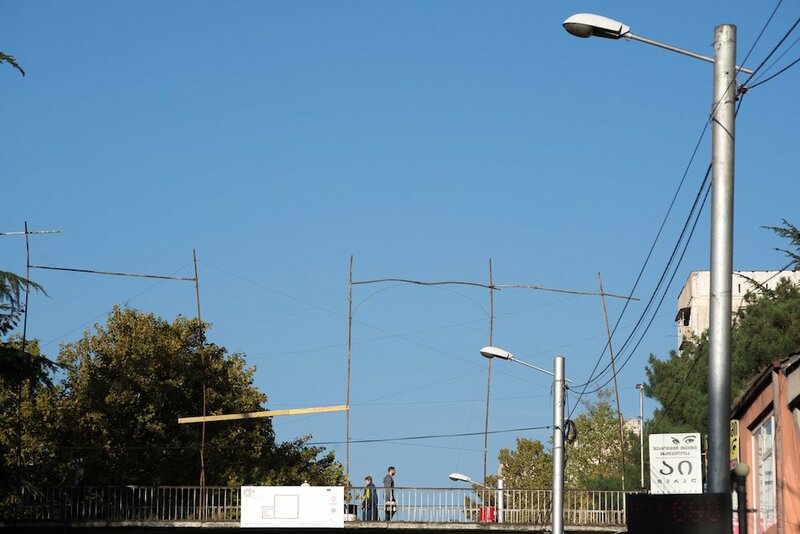 As a result, Shukakidze’s open call had clearly favoured artists who sought to embed their work within the scuzzy urban fabric — found or scrap materials, DIY-style knock-ups, and plays on the district’s architectural vocabulary recurred. The Basel-based Anti-Material Architecture group had worked with local builders to erect Informal Monument, a spindly metal and wood screen that crept over several residential buildings. In an octagonal courtyard, the Venetian Babau Bureau had recreated in garish pink paint a 1:1 scale floorplan of Rome’s fourth-century Mausoleum of Santa Costanza — what architect Stefano Tornieri described to me as “a little intervention” into the lives of their temporary neighbours. Tornieri’s comment reflected the desire of many artists to trouble the distinction between public and private space (“transformation of outer space is dependent on transformation of inner space,” as Shukakidze put it). 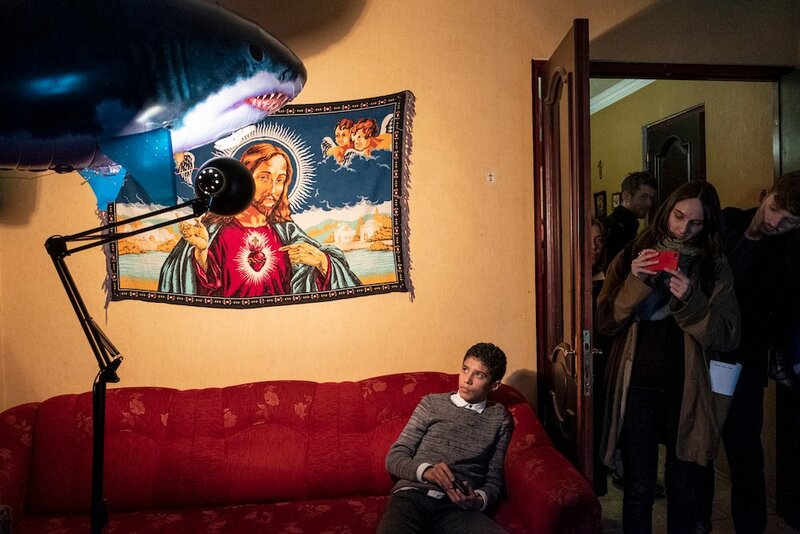 The clearest example of this was Block 76, a series of miniature installations inside the apartments of a single building, where residents carried on with their evenings as visitors peered into their bedrooms and kitchens in an echo of the “apartment exhibitions” staged by non-conformist Soviet artists in the 70s and 80s. Shukakidze and co had decided to make the Biennial unignorable for locals, and were rewarded in these moments of low-key but genuine communication. In a city that combines unchecked development with economic precarity, and where the architectural community sometimes wants for esprit de corps, an architecture biennial does have a powerful role to play. As TAB’s founders understand, it can unify the conversation, helping both professionals and residents express their concerns, even if actually solving them remains some way off. As a first run, TAB 2018 was hugely impressive, and should set the standard both in Georgia and in other post-Soviet spaces. 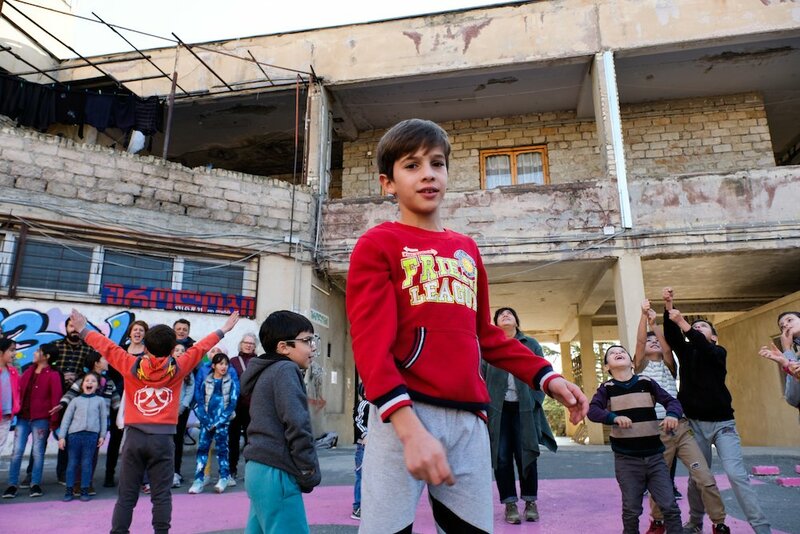 Still, it’s fair to ask whether the lauded engagement with residents in a place like Gldani — many of them displaced people and precarious immigrants — can ever be more than temporary. Gigi Shukakidze spoke of the Biennial installations as a means of “activating” the neighbourhood for those who lived there. But lived experience doesn’t need the patina of architectural theory or conceptual art in order to be meaningful. The concerns of the Gldani residents are more prosaic, for now. For one of the outdoor installations, Viennese duo Adrian Judt and Helene Schauer had piled up construction materials (breeze blocks, paint, planks of wood), intending to give them out for free to residents over the course of five days. They were cleaned out in 15 minutes. Elsewhere, Andrei of Anti-Material Architects told me that residents were already itching to deconstruct his sculpture to get their hands on the scrap metal; and just two days into the exhibition, another installation up the road had been sold to a neighbouring cobbler for parts. 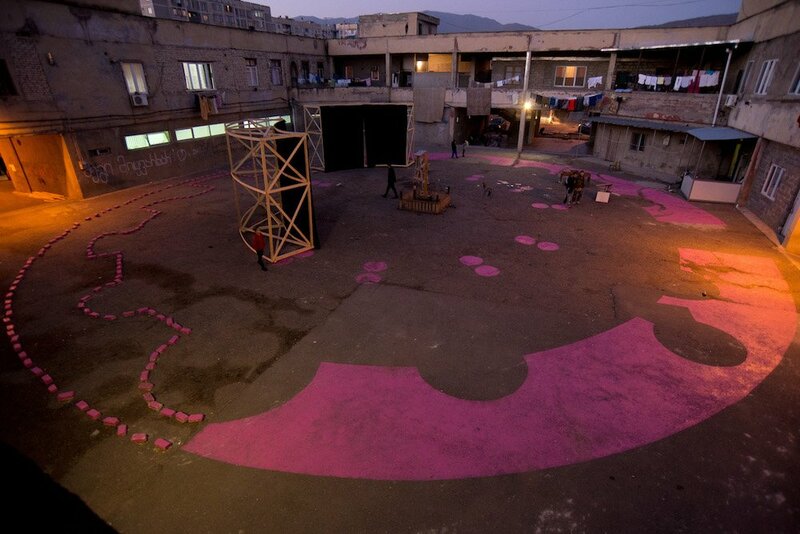 So, intentionally or not, Tbilisi’s new biennial did find a way of giving back to the community.